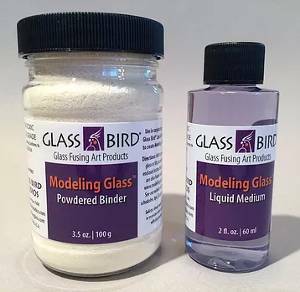 Modeling Glass is a product, developed by Lois Manno at Glass Bird Studios, that turns powdered glass into a moldable material that can be fused! It turns into a scupltable material that is similar to working with clay. The Powdered Binder that you mix with the Powder Frit is a food-grade, non-toxic cellulose-based material that reacts with water as a thickener. The Liquid Medium that you add to the powder is also food-grade and nontoxic, and combines with water to give body and smoothness to the Modeling Glass, while preventing stickiness. 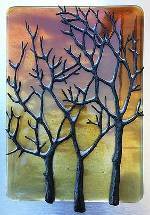 Both the Binder and the Liquid Medium burn away during firing, leaving pure glass behind. You can work with Modeling Glass in many of the same ways you would work with clay: roll into coils, roll into a flat sheet and cut out shapes, or press into silicone molds. Modeling Glass holds its shape without freezing. When fired to tack-fuse temperatures, it will hold an amazing amount of textural detail. It can also be thinned with water and used to create beautiful palette-knife textures. Combine colors to make your own blends. The Starter Kit contains one 3.5-ounce jar of powdered binder and one 2-ounce bottle of liquid medium. An instruction sheet is also included. This kit can be mixed with any COE glass powder to make over 3 pounds of Modeling Glass. 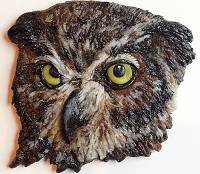 A sculpted, free-form owl made completely from Modeling Glass. It is about 4" across and 1/4" thick and done with only 2 firings. Created by Glass Bird Studios. Here is a downloadable Modeling Glass Instruction Sheet that comes in each Starter Kit, with tools list, mixing directions, firing schedule, and recommendations for storage. The mixing instructions in the above PDF for Modeling Glass were developed for use with Bullseye Glass powders. The ratio for mixing Modeling Glass with Oceanside's Spectrum/Uroboros or other powders is slightly different. INCREASE BINDER from 2 1/2 level teaspoons (6g) to 1 level tablespoon (7g). INCREASE WATER from 1/4 cup plus 2 teaspoons (60g) to 1/4 cup plus 2 1/4 teaspoons (70g). Follow the directions in the Starter Kit for details. If you want the material to be slightly drier, add a pinch more glass powder; if you want it to be more moist, sprinkle a few drops of water onto the ball and knead it in. 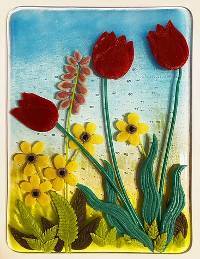 Great when making multiple elements that are then used to make an image like this 7" x 9" Spring Tulip panel (right).